The Beauty of Life: Colorist Jan-Marie Arteca Works Her Magic On Me Again! Colorist Jan-Marie Arteca Works Her Magic On Me Again! So, this past weekend I had my colorist Jan-Marie Arteca perform La Brasiliana on me. (More on that in a later post.) While I was there, she decided to do an impromptu coloring session ... and WOW. MY HAIR LOOKS AMAZING!! Jan-Marie decided to add in some red highlights underneath the top layer of hair. While we discussed the Jersey Shore finale ad nauseam, she strategically foiled a bunch of pieces. After I sat with the foils for about 15-20 minutes, she washed them out and then added a reddish-brown gloss over my entire head. The end result? The overall hue is a gorgeous reddish brown, almost auburn, with tons of vibrant red streaks running throughout. I've been getting compliments nonstop! My coworkers, friends and roommate just can't get over it. People, you must book an appointment with the fab Jan-Marie ASAP. 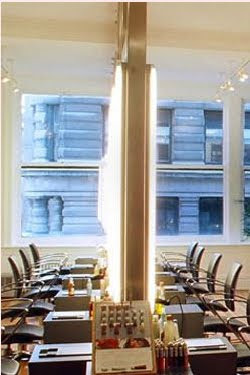 Call 212-633-6333 or visit tedgibsonsalon.com for more information.